you’ve analysed every scent and flavour. But it’s people who make whisky, and as Broom illustrates in his Handbook of Whisky, though scientists and accountants can explain how whisky is made, it takes a bit of a magician to actually make it. Broom uses his extensive vocabulary and light hand to paint vivid pictures of the towns and people he visits on an extensive tour of Scotland’s traditional malt whisky regions. Many myths are questioned along the way, beginning with the much-honoured theory of regional styles. His Scottish encounters are followed by enthusiastic confabs with the folks who make blended Scotch, Irish whiskey, American, and Canadian whiskies. There are hundreds of whisky books and dozens of new ones every year. Most are derivative editions, recycling earlier authors’ thoughts & perpetuating marketers’ fantasies.Broom’s avoids this trap. His approach is original, intelligent, and highly enjoyable. Unlike so many others, Broom has actually written a new whisky book. More than a compilation of facts, Handbook of Whisky is simply loaded with anecdotes, characters, and information, all hinging on the question: Is mechanisation changing whisky? Taking a balanced approach, he lets distillery workers tell us why and why not. It’s an easy read, more authored than written, and merits careful attention by the serious whisky aficionado. Why are some whiskies nutty, for instance while others are fruity? Well, according to Broom it all starts with fermentation times. Whisky-makers love to claim title to the oldest, highest, smallest, or most something-or-other, as if this somehow translates into better whisky. Those making such claims would do well to remember the Irish who likely were the first to distil the cratur. Their whiskey, once in demand world wide, suffered near extinction through a series of blunders and events, Broom sees clearly in hindsight. So confident were Irish distillers of perpetual demand, they simply dismissed the cost-effective continuous still invented by Robert Stein and Irishman, Aeneas Coffey. To them, the pot still would rule forever. The thrifty Scots though, quickly adopted the much less expensive continuous still, mixing its product with powerful malt whiskies to make flavourful but inexpensive blends that soon gained a stranglehold on the market. American prohibition and Irish independence eliminated Ireland’s major markets, then heavy taxation by the Irish government sounded the industry’s death knell. Being first meant nothing as Irish whiskey’s dominance ended, likely forever. By 1973 only a single distiller operated in Ireland, although it continued to produce dozens of familiar brands. Identifying whisky by brand rather than distillery may seem strange to single malt drinkers, but in America as in Ireland, it is flavour, not provenance, that determines the whiskey in the bottle. As Barton chemist, Bill Friel, told Broom: “If I have to modify a still I can, so it’s not impossible to replicate a product at a different distillery.” Similarly, when Heaven Hill lost its aging whiskey in a devastating fire it missed not a beat on the market. It simply shifted production to Early Times distillery for three years then moved on to a third plant in 1999. When this book was first published, in 2000, Japanese whisky was not enjoying its current popularity, and Broom did not include Japan in the Handbook. Given his considerable knowledge of Japanese whisky this would be a logical addition to an updated edition, as would comment on recent industry trends such as the current fascination with finishes, the progress of mechanisation, and more conversations with the people who make our daily dram. 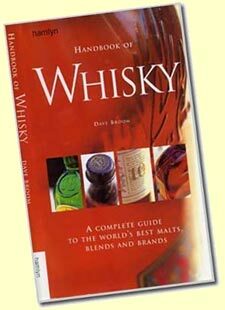 Handbook of Whisky provides a substantial introduction to the whiskies of the world. It’s a page-turner, but once you’ve raced through it, buy a map of Scotland and mini bottles from each of the Scottish distilleries included. Then, night by night, visit one distillery, sample its whisky, and plot its location on the map. Soon patterns will appear as you follow Broom across the regions, and learn about their individual whiskies. Thus educated, you are then ready, in Broom’s company, to appreciate the whiskies of Ireland, America and Canada as well.